I typically describe my style has feminine, relaxed & classic. But this Fall I am finding myself drawn to edgier pieces, darker colors, more layered looks. On the list of things that are really doing it for me these days: chunky chains, military inspired jackets, urban shoes, printed denim & messy locks.... who am I? Has your style outlook changed for Fall? What Fall denim are you crushing on? Don't forget to enter to win 1 of 3 pairs of jeans Celebrity Pink Jeans is giving away to 3 of you lucky ducks! Really like this look on you! The jeans are bold, I really like how you paired it with muted tones - it totally works! Can't wait to see you style it! Love the military jacket and those jeans are really fun! I have a military jacket and looooove it. I wear it all the time and can't wait to break it out again this fall! I am looking for a vest version too - I'm only a little late on that trend! I'm obsessed over the color of your hair. Great look by the way. Love those pants! I like the edgy look on you! You can seriously rock anything. Not a huge fan of the pants, but thats just me. I do like the layers and the necklace! Love your chic styling, the printed jeans look terrific,your necklaces are so pretty. 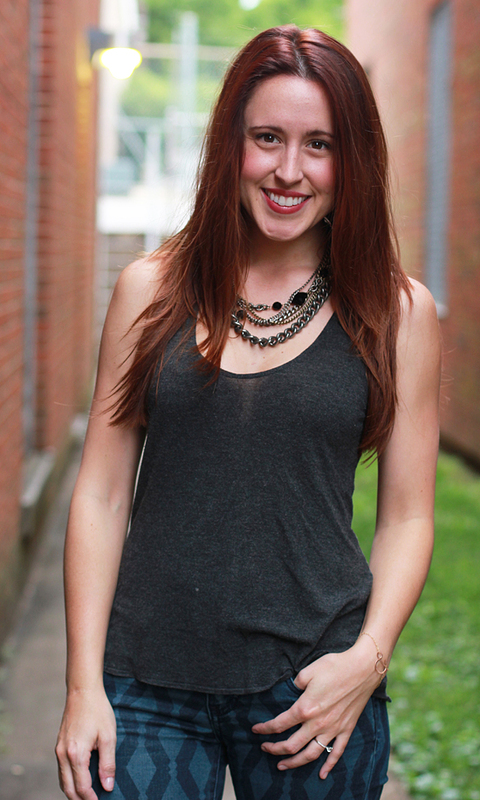 Loving these edgier layered necklaces on you! The add the perfect amount of moodiness to the outfit! That jacket is everything! Headed to Jcrew in 3...2...1.. These jeans/pants are awesome on you! I love the understated pattern! LOVE the jeans! I've been looking for a good pair of printed jeans!! Thanks for your lovely comment on my blog, would you like to follow each other?? The print on those pants is so fun! what fun jeans! they look great on you! I think it's fun to change up your look every once in a while and go for something different! love the simplicity of your grey tank with those jeans! Such a cute look! i have sneakers just like that! Your blog is amazingggg!! Now following! great giveaway!! I love the pink aztec jeans, so cute!! oh man, totally loving the print on those pants! Fall always makes me want to dress a little edgier! You look gorgeous girl. easy and stylish! love the color palette! This is one super cool and super cute outfit! Love the pants, love the sneakers, love the jacket, love it all! Love your outfit and the layering is gorgeous! Awesome that you are experimenting with your style! It is fun to change it up every now and then! I love that jacket! It would go with everything! You're looking like a total babe in those Wallis high tops! Love that jacket too, Jessica. Is it weird that my fav thing about this look is you hair? It looks stunning with the dark colors of the outfit. I'm sure this won't be shocking, but I love love LOVE this look on you. Those pants are hot! Who are you???? I will tell ya!! You are a young woman playing and having fun with fashion!!! That's what it's all about!! I am totally digging this look, lady!! Own it! 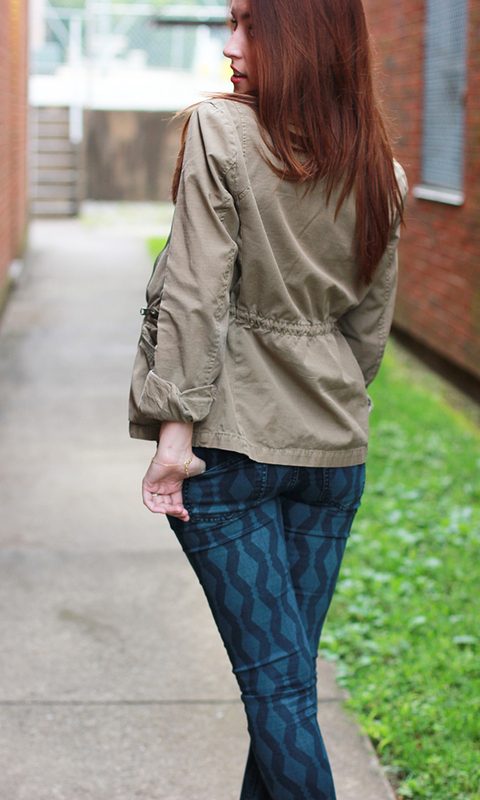 I love the military jacket with the printed jeans!! And I definitely see myself leaning towards more edgier pieces once in awhile. Love this! These pants are so fun, Jessica! You look great! 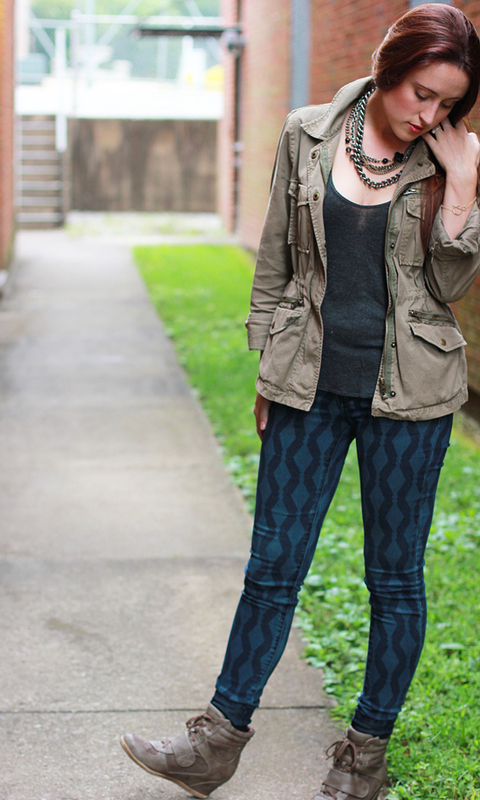 Stopping by via Real Girl Style's link up! 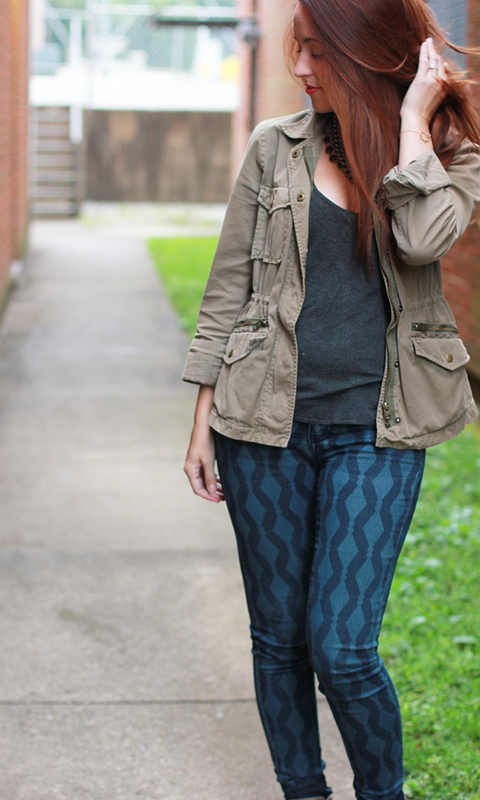 Cool giveaway and that is a perfect layered look for fall! Great outfit! LOVE the jeans!